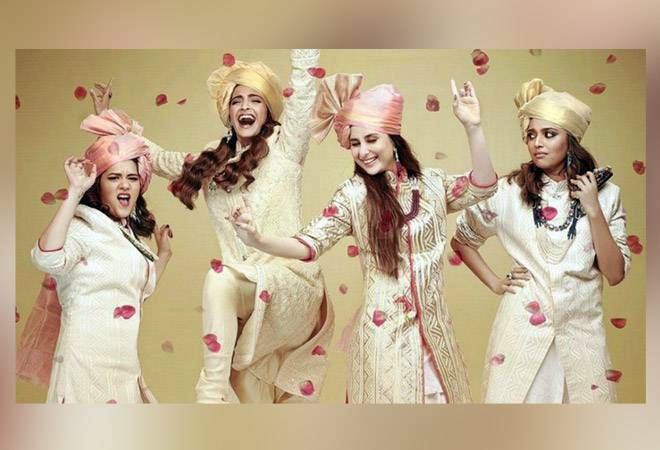 With a strong, female-only main cast, Veere Di Wedding secured a good start at the box office with a first day collection of Rs 10.70 crore. With a strong, female-only main cast, Veere Di Wedding secured a good start at the box office with a first day collection of Rs 10.70 crore. The Kareena Kapoor-starrer beat Akshay Kumar's Padman and Ajay Devgn's Raid to become the third-highest opener from Bollywood in 2018 so far. Commenting on the strong show by Veere Di Wedding, trade analyst Taran Adarsh tweeted, "#VeereDiWedding has a WINNING START on Day 1... Makes its way into the TOP 5 OPENERS of 2018... Expected to build up a SOLID TOTAL over the weekend... Fri Rs 10.70 cr. India biz." #VeereDiWedding has a WINNING START on Day 1... Makes its way into the TOP 5 OPENERS of 2018... Expected to build up a SOLID TOTAL over the weekend... Fri â‚¹ 10.70 cr. India biz. The film also managed to do well overseas, entering the top-10 charts of Australia, United Kingdom and New Zealand. "#VeereDiWedding takes a SOLID START in key international markets on Fri... AUSTRALIA: A$ 108,246 [Rs 54.87 lakhs]... Debuts at No 7 UK: GBP 65,423 [Rs 58.49 lakhs]... Debuts at No 8 NEW ZEALAND: NZ$ 35,975 [Rs 16.82 lakhs]... Debuts at No 5," Adarsh tweeted. "The general feeling is, cuss words and adult themed Indian movies *DON'T* work Overseas... #VeereDiWedding has shattered the myth... The film breezes into the TOP 10 charts of Australia, UK and New Zealand and this is no small achievement... Data follows... @Rentrak," he further added. Directed by Shashanka Ghosh, Veere Di Wedding has Kareena Kapoor, Sonam Kapoor, Swara Bhaskar and Shikha Talsania in its main cast. The film tells the story of the bond between the four protagonists and their relationships. Veere Di Wedding also marks Kareena Kapoor coming back to silver screen after a two-year break.